REMINDER: Ring Doorbell and Camera Rebate Program Launches Citywide Tomorrow, October 25 at 8 a.m. 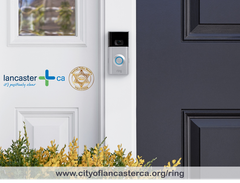 The City of Lancaster and Lancaster Sheriff Boosters’ Ring Doorbell and Camera Rebate Program will launch citywide tomorrow, October 25 at 8 a.m., at which time any Lancaster resident may submit a completed “Lancaster Resident Application.” There are a number of discount codes still available, which will be distributed in order of application submittal. The City of Lancaster is offering a $50 per household subsidy; Ring will match the $50 subsidy for a total discount of $100. Residents interested in purchasing the Ring Video Doorbell 2 will receive an additional $50 subsidy – provided through a generous $50,000 contribution from the Lancaster Sheriff Boosters – for a total discount of $150. To submit an application to receive a discount code, and to learn more regarding the Ring Doorbell and Camera Rebate Program, visit www.cityoflancasterca.org/ring.